Peggy is single, childless, in her 40s, a lonely executive assistant in a friendly office. 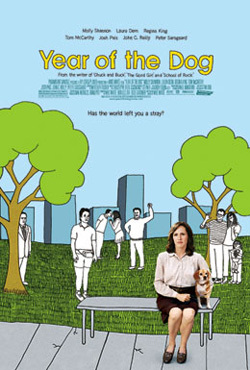 Her dog Pencil is the love of her life, and when he dies after eating some sort of toxin, Peggy's life spins out of her control: a friendly neighbor invites her for dinner; a friendly staff member at her vet's calls with an abused dog he recommends she adopt - she does, and also finds herself attracted to this fellow. She becomes a vegan, supports animal-rights causes, and embroils her brother's young children in these concerns. Saving dogs and other animals become such a passion that her mental health and her job may be in danger.